Summer Outdoor Retailer—mophie, today debuted its action sports camera, outride, a hardware and app solution that puts the power to record and share tricks and epic moments in the hands of action land and water sports enthusiasts, using only their iPhone. OUTRIDE eliminates the need for dedicated video or camera devices, which add bulk and can cost upwards of $300, by harnessing the existing features of the iPhone and adding the hardware and software for outstanding, all-in-one filming, editing and sharing. 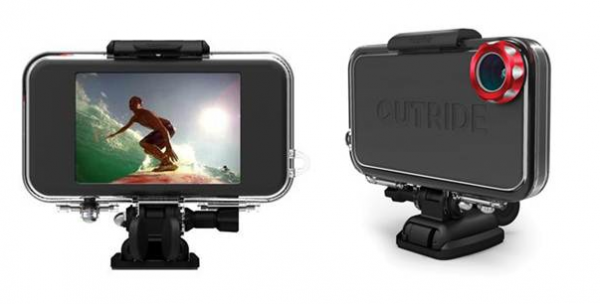 OUTRIDE hardware is waterproof and impact resistant and comes bundled with a variety of custom mounts to capture action shots in the surf, snow, dirt or concrete. "With the ever-growing action sports market, and our success in developing ruggedized products for those rough-and-tough tech users, we felt we were ready to design and develop a product that would take the iPhone and its camera capabilities to its limits," said Ross Howe, vice president of marketing at mophie. "While the action sports community has a lot of camera and video options to choose from, they weren't able to share their moments with the community in real time. OUTRIDE gives the action sports community these capabilities in a durable, compact, quality and cost-efficient way."